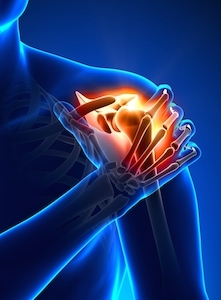 Shoulder Fractures | Nashville Injury Lawyers The Law Offices of John Day, P.C. The shoulder is made up of three bones: the scapula (shoulder blade), the clavicle (collar bone), and the humerus (upper arm bone). Each of these three bones is crucial to ensuring that you have proper, pain-free shoulder function. When subjected to trauma, though, any of these three bones can break, resulting in a shoulder fracture or broken shoulder. The most common type of broken shoulder is a broken clavicle, or collar bone. The collar bone may break as a result of a direct blow to the shoulder area. The shoulder blade, on the other hand, is protected by the chest and surrounding muscles. It is not easily fractured. Broken shoulder blades are usually the result of high-energy trauma, such as motor vehicle accidents or falls from heights. Though your symptoms will depend on which bone you fractured and the type of fracture you suffered, generally a broken shoulder will cause pain, swelling, bruising, the inability to move your shoulder, a grinding feeling when you try to move your shoulder, and shoulder deformity. If the fracture was in the clavicle, you may have a bump near your bone and swelling near the middle of the collarbone area. If the fracture was in the shoulder blade, you may have severe bruising directly over the shoulder blade bone. Fortunately, approximately 80% of shoulder fractures are non-displaced fractures. This means that the broken pieces stay near their correct anatomic position and the fracture does not require surgical treatment. Typically, non-surgical treatment for a broken shoulder includes immobilization in a sling, and most shoulder fractures heal in about six weeks. Around 20% of broken shoulders, however, do require surgery. These surgeries usually include securing the bones in their proper positioning with metal plates and screws. Whether your shoulder fracture requires surgery or not, you will most likely need to go to physical therapy to regain full use of your shoulder. Physical therapy can help prevent stiffness and weakness and allow you to regain your shoulder strength. Unfortunately, even with physical therapy and rehabilitation, a shoulder fracture may leave you with residual shoulder stiffness. If you or someone you love has suffered a shoulder fracture due to the negligence of others, call us any time at 615-742-4880 or toll-free at 866.812.8787 or simply fill out this online form and we will call you. We will review your case in a free, no obligation consultation and let you know whether we can help. We handle all accident cases on a contingency basis. And unlike some lawyers, we advance all case expenses so you are never out of pocket any money to pursue your legal rights. For more information on our fees and how we handle expenses, click here.